My condolences to the Eriksen Family. Farewell Mr. Eriksen, it was an honour to serve you. Deer Valley kitchen staff member 1999-2004. Stein inspired me for my entire life, as he did countless others. 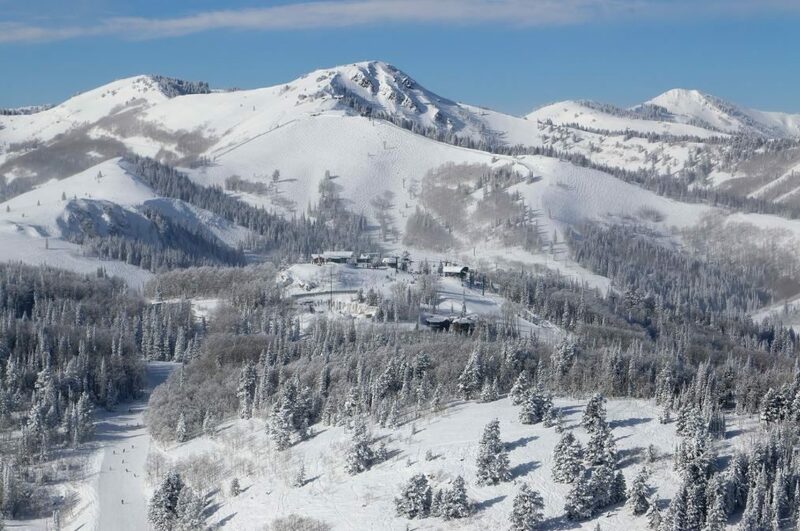 We shall miss the “real-life Ullr.” Skiing has lost part of its soul. Thank you Stein for all of the “lunch pail and shovel” work you did back in the Midwest. I was one of those Flatlanders who decided to put on a pair of “sticks.” I’m still trying to figure out how you make those turns look soooooo easy. Living on the prairie, it is not so easy. But it is still fun. And for me, once in a while, the boots, skis, and poles all align. And it’s soooooo cooooool. God bless him and his family. He had a vision and we all get to enjoy it. He will not be forgotten. Stein was my idol and the reason I started my alpine skiing career back in Norway. I’m glad I had the opprotunity to meet him several times at Deer Valley. So sad that he is gone, but what a great legacy he left us with. RIP Mr. Eriksen. You influenced so many…including me. Thank you for your contribution to such a great sport. My son, who is 15 yrs old, will often grab his straight skis, put on a sweater & black pants, and hit the mountain to ‘ski like Stein Eriksen’ from years ago! 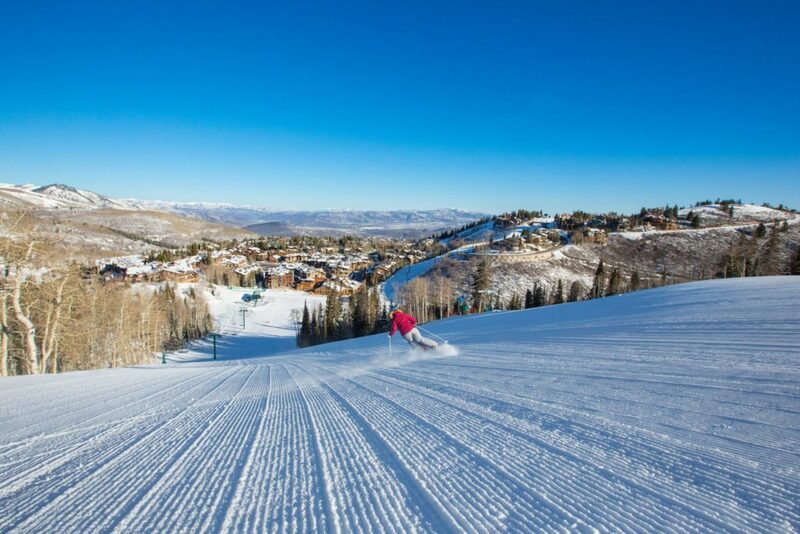 We all lost our legendary icon of modern skiing and especially at our beloved Deer Valley. I will always remember how warm and loving he was to my children during a Christmas Day brunch at His namesake beautiful lodge. Always friendly and ready for pictures with whomever requested it. He was our skiing ambassador and one class act!! He even helped me personally when I bought a new helmut in his Sport shop and gave me a hug. Remembering him in the Olympics parade a couple years ago in the 1967 GTO looking so classic Stein in the back seat of the convertible, even more meaningful after the serious accident he had incurred a few years before. May he make some classic Stein turns in the endless heavenly powder in Heaven !! Rest in Peace Stein – you will be so missed by all of Park City locals and the many lives you touched with your amazing life. It was my pleasure to have known you even if it was a short time that I worked for Stein Eriksen Inc. From 2001-2003 we made it through the Olympics in Utah and I was proud to be part of your team. You are a legend here in Utah and I remember skiing in my youth and wanted to ski like you. My thoughts and prayers go out to the family. I/We have lost a friend who was a true icon of the ski industry! He will be deeply missed! I never did get that glass of wine your promised me after running into me at Deer Valley. Truly a great skier, and a wonderful man. I also remember the park city town races years ago, and seeing up close what a powerful skier he was. a great skiier,a great friend and a true gentleman. you will be missed every day. 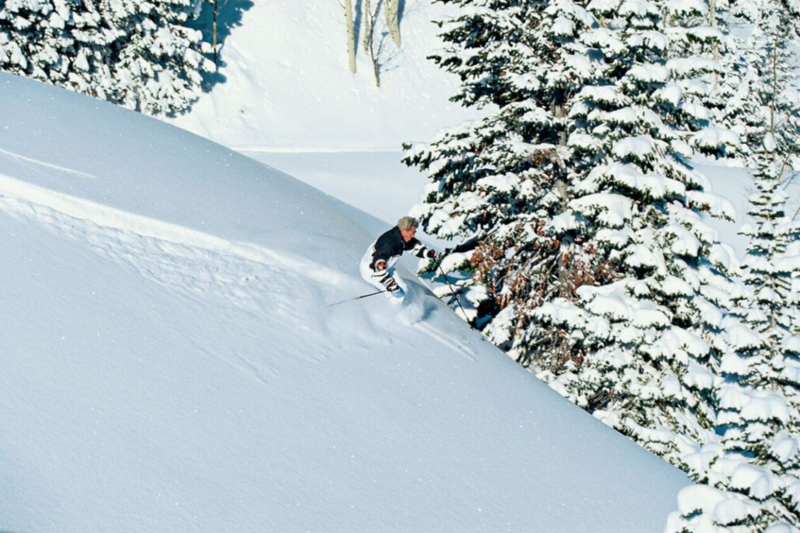 It was a privilege and the highlight of this young ski instructor’s career to have worked for Stein in the mid-70’s. He was my boyhood hero and I grew up watching him ski in the east. He also was an inspiration to me during a difficult time, it was questioned whether I would ski again. He knew I could do it and I did. And enjoyed many fun runs with Stein for years later. I was always proud to be “one of his boys”. Rest in peace, Stein. We will ski again. It is hard to think of an individual who was more instrumental in the popularization of skiing and the development of the ski industry that Stein Eriksen. He was a giant in our industry and will never be forgotten when people talk about the greatest skiers of all time. Stein will be dearly missed in all ways! He was a true visionary in his sport, and the Oakley family will always hold him in their hearts! I’ve know of Stein ever since I learned to ski in central PA (~1960, when I was 13 yrs old). I finally got to meet him while skiing at Sugarbush, VT. He was larger than life then, and I practiced my turns to at least try to emulate Stein. No one could look like Stein ….but he gave us all something to shoot for as we dreamed. He will be missed by many dreamers! RIP Stein. Deepest Sympathy to your family. You had a wonderful life doing what you loved. Stein has been a hero of mine since I was 10 years old. He taught me how to Bowl when I was staying at the Sun Valley Lodge. I loved speaking with him when I visited Deer Valley and always reminded him of our early adventure long ago. Currently I have surpassed 75+. He was always so kind and a true gentleman. Nobody I know kept the same appearance his whole life, he was always immaculate. We always looked for Stein during our annual trips to Deer Valley and the highlight was meeting Stein and shaking his hand outside Empire lodge. Stein was a true pioneer who brought a style and grace to the sport of skiing that will not be forgotten. He leaves a great legacy. graceful but very fast. i tried to copy that wonderful style. He was a pleasure to watch and a super man. When I lived in Sacramento in northern California and learned to ski in the various resorts around Lake Tahoe I marveled at his technique in his majestic turns which I could never develop. It was always a pleasure to go to the once a year movie that Warren Miller brought to town and try and catch a glimpse of him.To me, he was like the champion of ballroom dancing in skiing—-may I suggest the waltz! Are there any copies of his earlier films available? I remember how I amazed I was when I saw them. Even today no one is his equal. Love to see some posted on YouTube. I was privileged to re-learn the sport of skiing in the 1980s when I got a chance to ski a number of times with Frank Covino at Sugarbush North. Frank, a terribly elegant skier himself, taught me as much as I could absorb of the Eriksen style which I’ve kept with me and held dearly ever since. I heard a lot of Stein Eriksen stories from Frank and became a great admirer of the man. Rest in peace Stein Eriksen; you had a gift that you graciously gave the world and I for one will always be grateful. May your legacy live on in a new generation of elegant skiers. After attending a Bob Beattie ski camp in 1976, I learned of, and saw pictures of Stein Eriksen. So for the past 40 years, just as Rich’s son says, “Ski like Stein”, has been my motto every time I have hit the slopes. My deepest sympathy goes out to the family of this great ambassador of Skiing. The ski world has lost a truly great skier, you’ll be missed! Thank You for all you did for this sport! I thought your write up on Steins life was great but I felt something was missing in the bio. I recalled that he had spent time at Sun Valley when he was young. I found a used copy of his book “Come Ski with Me” on Amazon and got it today. Sure enough, he spent a few seasons here in the early 50’s. And writes about teaching in 1953. His Stein Turn came from the SV bowls, Christmas, Easter, etc. There are great old photos in the book, may have to ski in a Nordic sweater tomorrow! 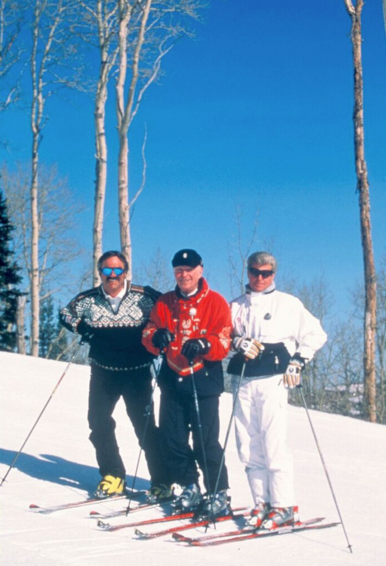 I had the pleasure and privilege of skiing with Stein and Pepi Gramshammer at Deer Valley during the time of the 2002 Olympic games. As a former racer and skier of over 40 years it was one of the highlights of my skiing life. Mr. Eriksen will be greatly missed but not forgotten. My father mimicked Steins skiing style and skied it until he was 88. I grew up watching his TV show where he would start with his forward flip. How cool and what a an icon. A legend gone but not forgotten. My friend and I, both from Michigan, “ski-bummed” at Aspen the winter of 1960-61. we had the good fortune to meet Stein and his Norwegian instructors who came to instruct at Aspen Highlands. It was very small then and Aspen was a wonderful town then. At a party we attended, Stein introduced himself and, in European fashion, kissed our hand. What a thrill for 2 gals from Detroit. Now living in Colorado and skiing for years, I had hoped to meet that fine gentleman again but could never get to Deer valley. He, his style and grace will be truly missed on the slopes. What a legacy! after that great luminary in the world of skiing. Stein’s loss is a great sadness to all who have grown up in skiing. His influence in the sport went far beyond his actual presence. My own acquaintance with him began in 1950 shortly after he had distinguished himself in the Federation Internationale de Ski (FIS) competition held in Aspen that March. Stein already had left Aspen when I arrived but his legend was well underway. Almost immediately I needed new skis and the Aspen ski shop fitted me with a pair of Marius Erickson 210 km which the salesman claimed had been worn by Stein in the competition. To prove it he pointed to a small red dot just forward of the boot toe irons that he said was Stein’s trademark. Whether or not that was the exact truth, I was happy to accept it and obtain bragging rights among my skiing friends. They were wonderful performing skis, limited only by their owner. Then in August 1953 the Navy ship on which I was serving called at Oslo. There at the boat landing was Stein cordially welcoming our fleet to his homeland. And yes, I had a chance to ask him about the red dots on my skis and he corroborated that that indeed they were his trademark. So be it. I enjoyed those skis for quite a few years but even Ericksons have a life expectancy of only so many moguls and I eventually had to retire them. However, it was a privilege to ski for a time in the shadow of greatness and with the memory of a most gracious gentleman. 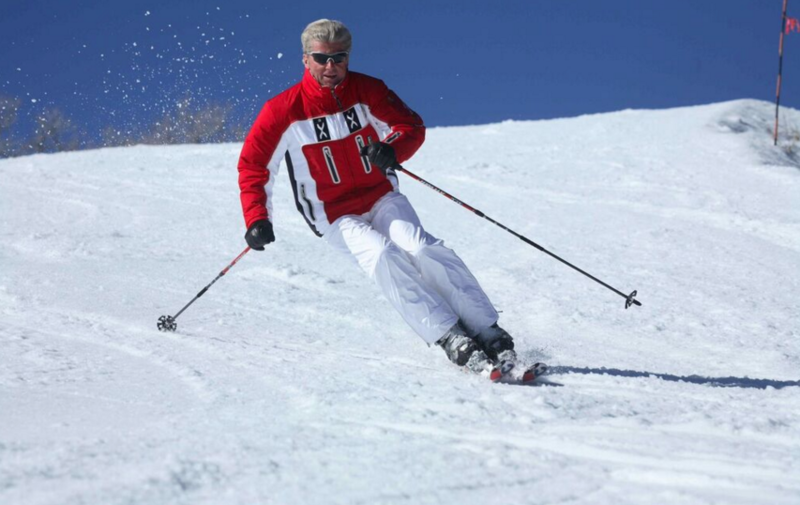 Every mountain Stein ever skied will be forever graced with his elegant athleticism and grand enthusiasm. His love of the sport was inspiring and contagious. Eternal gratitude and appreciation for Norway’s son, Stein Eriksen. I first met Mr Erickson when I was on a family vacation with my 4 children perhaps 20 years ago. We were staying at Park City and decided to ski Deer Vally. Late AM as I was standing half down a bump run taking videos of my children sling down the hill, I lost my balance and fell down hill fracturing my left wrist. Had to ski a few runs until I could work my way across the mountain to ski in. It was then on top of main chairlift that Stein Erikson skis off lift in one piece Bogner ski attire. I immediately recognized him, very handsome and svelte with full head of hair and sunglasses. I introduced myself and told him that I just broke my wrist. He commented “How can you ski with a broken wrist”? To that I responded that a few years ago I tore my Achilles’ tendon skiing. To that he responded that he to had torn his Achilles I have entire conversation on video. He politely skied away as I attempted to follow him down the mountain. I was in awe of the beautiful graceful style of his skiing. He softly glided down the mountain with the characteristic Stein reverse shoulder turns. His legs so closely together so relaxed. I will forever cherish that moment in time. My idol as a child and the architect of my skiing style today at 65 years old ! I was never privileged enough to meet Stein when he was Ski School Director at Sugarbush, VT, but attribute my undying lkve of the sport solely to him. Rest I peace and may all your days in Heaven be filled with untracked powder and clear blue skies. You will be greatly missed ! 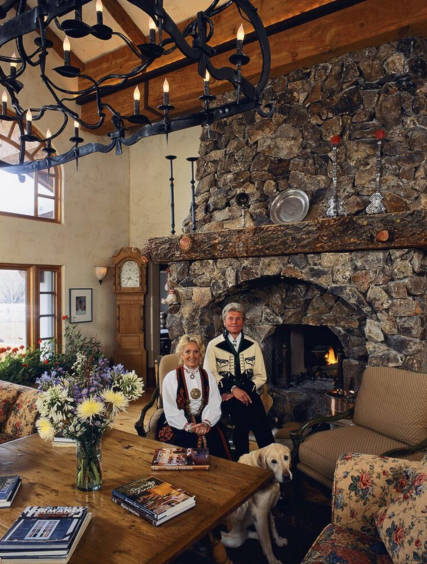 As seasonal residents and skiers in Park City, we frequently skied Deer Valley and of course spent many days at Stein’s Lodge. We met him at the lodge and on two occasions had lunch at the table next to him. More than once we drove by his private home and prayed over Stein and his family, as prompted by God. Little did we know that he would be passing on shortly after our heart felt prayers. Stein will be greatly missed, but we know he is seriously enjoying Heaven right now and for ever, just as Heaven is blessed to have Stein as a new resident member of the Divine family. The sport has lost a truly great sportsman, one of the most beautiful, fluid skiers I have ever had the opportunity to follow down the mountain. I feel I was truly blessed to have had the opportunity to meet him several times and to get to ski with him twice in my lifetime. I have an autographed poster hanging on my office wall of Stein skiing, with the Deer Valley and Marker logos on it. Also I have the Deer Valley Marker jacket from one of my favorite ski days ever that I bought at Jan’s Sports in 1992 to remember the 18″ of fresh powder we skied on that day. Every time I look at the poster or wear my old marker powder jacket it reminds me of Stein and the Deer Valley resort, which is always my number 1 at heart. Bless the Erickson family and all of the friends that knew and loved the man. He will be missed, but never forgotten. We were just talking about Stein this week when sking. i never met the man but, i grew up like many watching him in the sixtys on a school night when he had a short caption with his ski tip of the day between the news. I received a great xmass gift about four years ago from my wife. much to my surprise was Steins book come ski with me. i loved his art form of sking which i still try to do. i just found out about his passing. what a great man. You should be very proud of him . He showed me a better way to ski and enjoy it more. dcccc To the Erickson family God bless and my deepest regret. 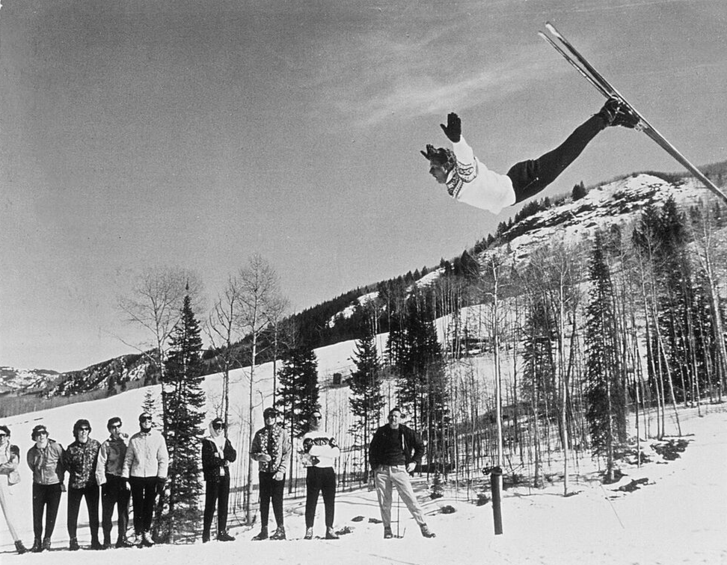 Skied with Stein at Snow Basin Utah 1977 when he and two of his young instructors competed in a race. Stein styled down the giant slalom course. Talking with him was a great inspiration in those early years of life ! His memory is always with us to remember. I had the great pleasure of meeting Stein on a trip to Deer Valley.He invited all the guests of The Lodge to a cocktail party. I had a change to talk to him and tell him that he had a lot to do with my love of skiing and he was my idol. He skied every day and the Lodge had a copy of todays outfit on display so people could spot him. What a thrill to ski with him. I was planning a return trip with the hope of meeting him again…..
RIP, he will always be remembered….